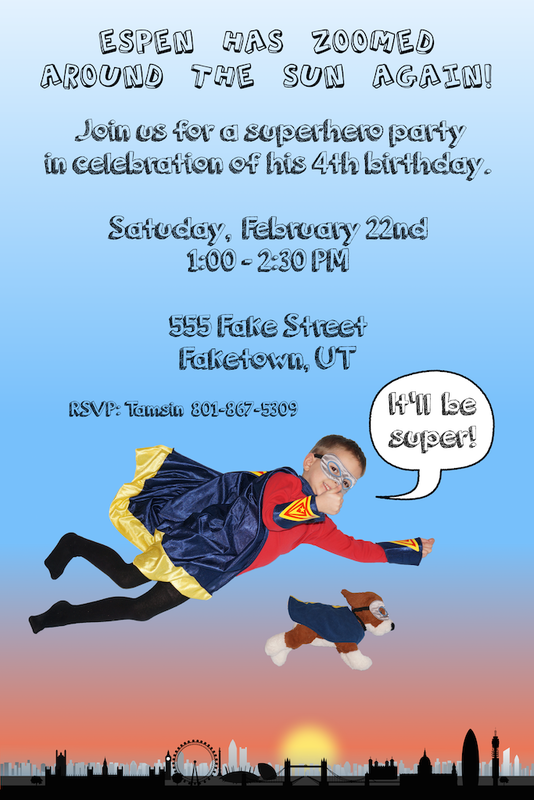 Project Project: Superhero birthday party! I always like to start with the invitation to set the tone for the party. Plus, once they're sent there's no turning back! This time I bullied gently persuaded Nick into using a few of his talents to put together this invitation. For the photo, we had Espen (and Woofy!) lie down on a blue sheet in his superhero costume and strike his best flying pose. Then Nick did a little photo editing magic (look at Woofy's legs!) while I made outlandish requests, and after a lot of giggling at the sight of our little superhero flying through the air, we were done! The birthday boy awaits his guests. I always feel like every party needs a statement piece. Something that tells your guests that "this is a party". Something that shows them that you have put some thought and effort into their enjoyment, and that they will remember after they leave. 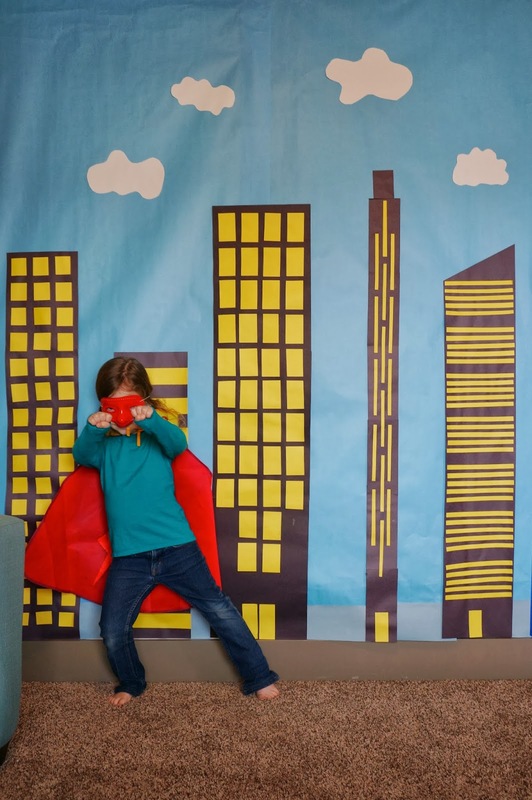 This time I decided to make "the big thing" a photo booth/backdrop in the form of a cityscape for the little caped crusaders to pose in front of. The whole thing is made of butcher paper and construction paper, and cost less than $3 to put together. Luckily I tend to like the charmingly homemade esthetic! The most time consuming part by far was cutting out and gluing on all those little windows, otherwise you could easily put it all together in less than an hour. We put it in the sitting room right inside the front door, so it was the first things the guests saw when they arrived, and it really set the scene for the party! We snapped shots of the more willing posers as they arrived and suited up. 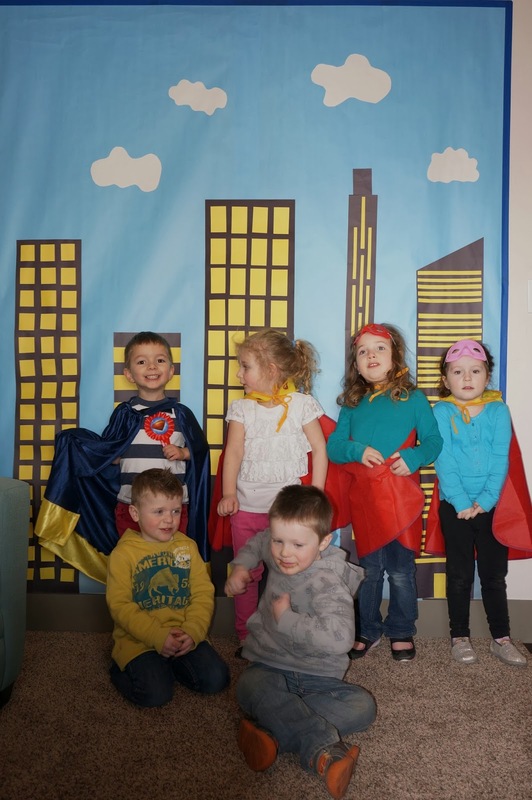 This was also where we kitted the guests out with superhero capes and masks. 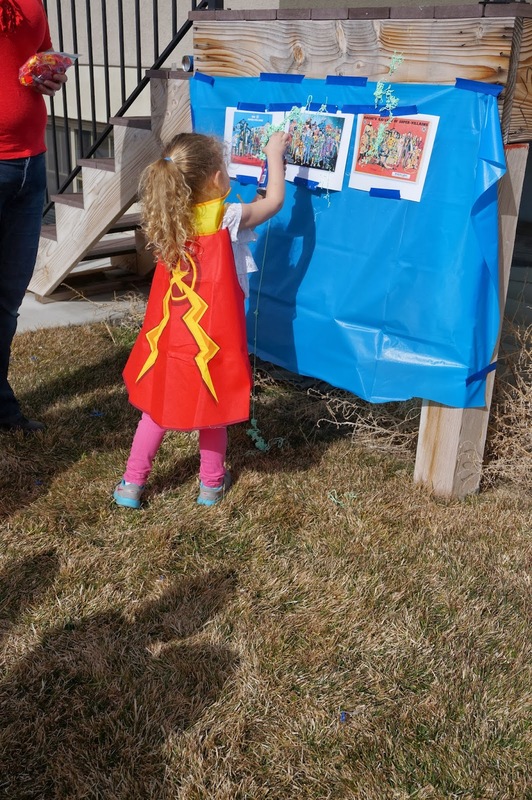 Interestingly, the girls were all about donning superhero garb, while most of the little boys were really hesitant about it. I didn't see that coming at all! Espen, however, who is after all an actual superhero was happy to party with the ladies. Smart boy! Busting some super heroic moves. Uncle Cody wanted in on the action too. Group shot! Preschoolers are wiggly. So very wiggly. Espen has requested that we hang it in the playroom, so it will be going in there as soon as I've figured out a better way to hang it than blue painter's tape. You've got to have balloons! Once everyone was here and those who wanted to were in costume, we headed into the living room to open some birthday presents. And then it was time for some treats! Where party food for small children is concerned, I have learned to keep it simple. They're small eaters at the best of times, and are usually too wired at a birthday party to really be very interested in food. 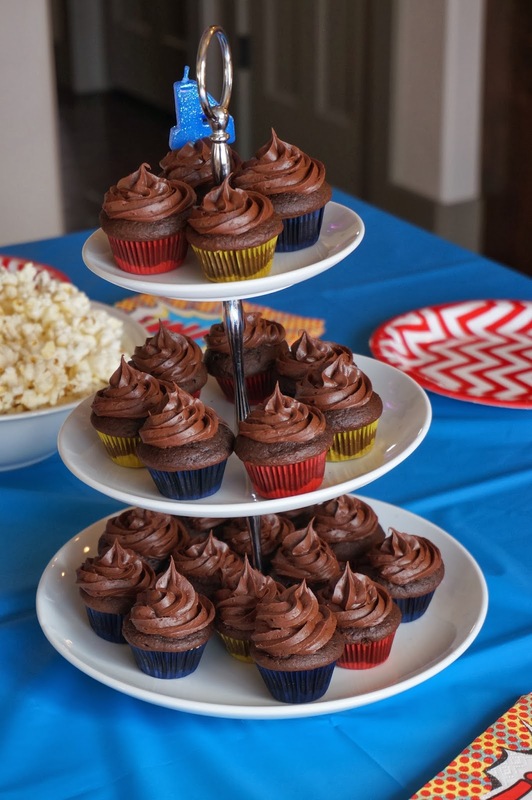 So rather than be left with a mountain of leftovers, we made mini cupcakes and popcorn, served with juice boxes. 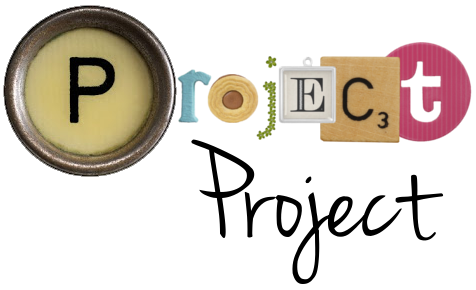 I was going to make cute little cupcake toppers, but ran out of time. But guess what, nobody cared one bit. Espen and a little buddy eat up. 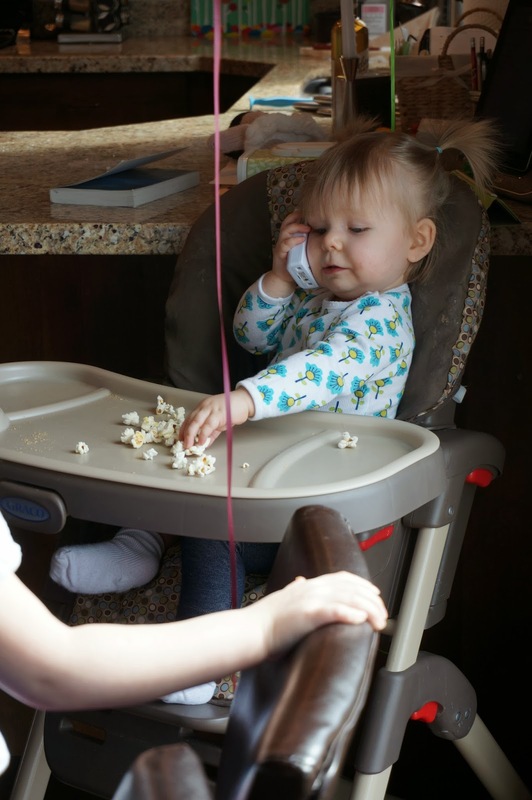 Gwen (seen here chatting on her baby monitor phone and casually snacking on some popcorn) enjoyed being one of the gang along with the big kids. 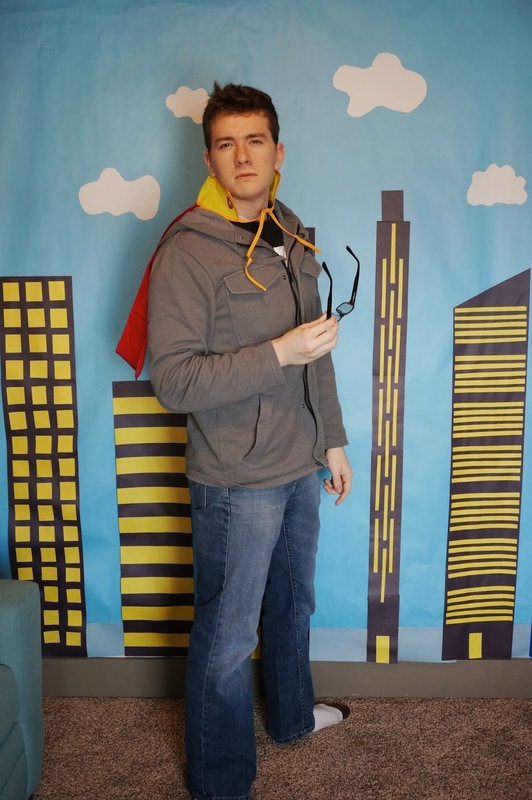 Because Espen is more interested in the idea of superheroes than in any actual superhero character, I tried hard to avoid any DC or Marvel characters. Not that they aren't awesome, but I just feel like he's still a little too young to be into the Avengers and whatnot, y'know? 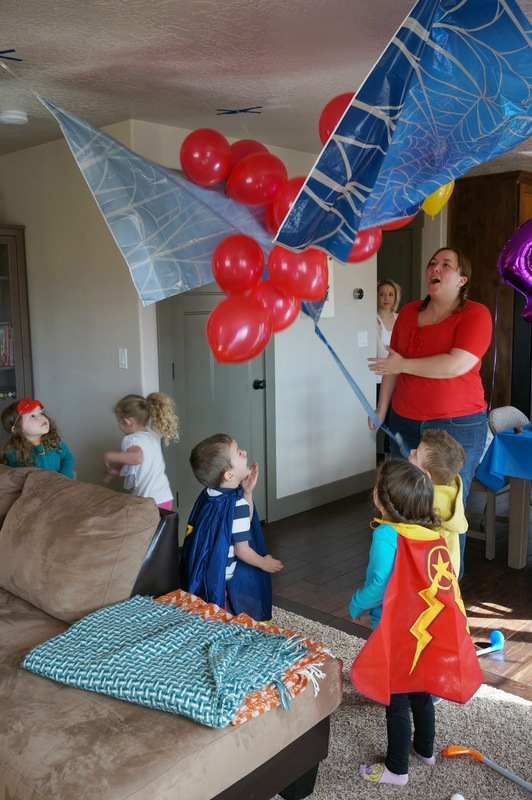 But when we were at the party store Espen fell pretty hard for this Spiderman balloon drop, and seeing as it wasn't too Spiderman encrusted and I was kind of in need of another activity, I ponied up the $6 and got it. The kids loved it and played with the balloons for quite a long time, so it was worth it, I think, even if you wouldn't find it lovingly handcrafted on Pinterest. I assure you I am shouting festively. After some cavorting with balloons in the living room, Espen invited his friends outside to crack open the piñata. In my opinion, piñatas are overpriced before you even start filling them up with candy, and fairly wasteful when you consider than you just throw them away minutes later. But they are also lots of fun and make a good group activity. And birthdays are only once a year, so we got one. And they loved it! Note: A small ragtag band of three and four year-olds are not going to break up a piñata by themselves, so keep a dad or an aunt with a powerful swing on hand to bust that sucker open, then stand back and watch the kids fall on the candy like vultures on a water buffalo. And remember to provide bags with names on to keep everyone's loot safe. You could make these cute and themey, or you could write their on ziploc baggies with a sharpie because you misplaced your cute little paper bags. You do what works for you, my friend. Some super villains were spotted at this point, so we armed our heroes with cans of silly string and pointed them in the direction on the baddies. Uncle Cody and aunt Becky face off. And then we reached the point where the kids could no longer ignore the giant playset in our yard, and we sort of blinked at the sun and let it sink in that it was a gorgeous day outside, so we went off script and played in the yard until it was time to head inside before the moms and dads came to pick up their pint-sized vigilantes. And that was that! 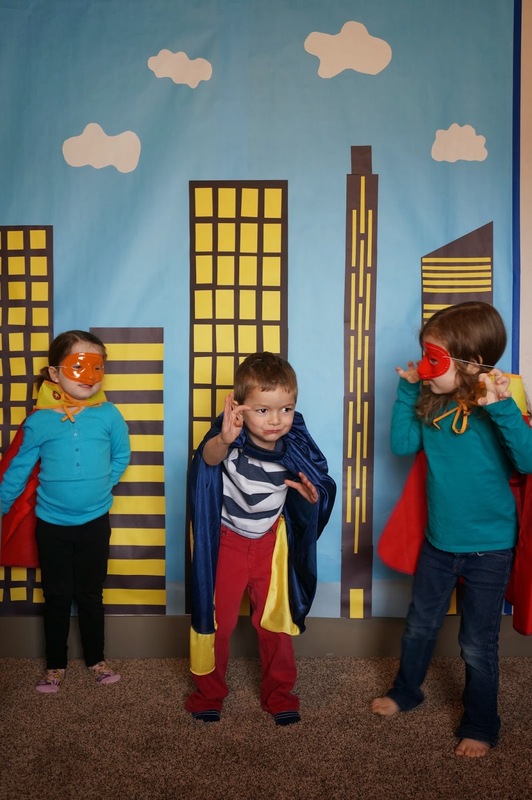 It was definitely a lot more low-key and less labor intensive than some of our previous birthday parties, as I am learning to simplify and go with the flow a little more, but it was in no way less fun for the kids. All they really need is a few cues to set the scene, and off they go! Something I hope I'll remember for parties to come. Espen's Superhero cape and wrist bands. 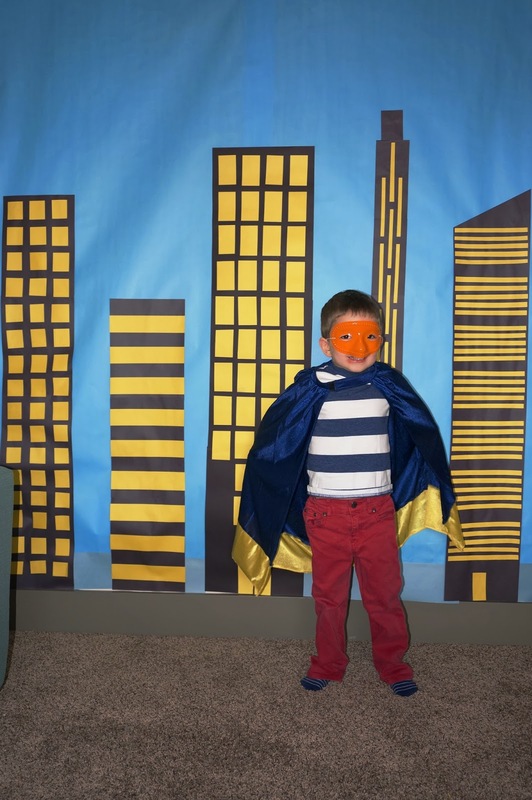 For more party ideas, check out my Superhero party board on Pinterest!